The South Kenginston Museum apparently has an extensive collection of Chinese pieces. In 1867, they published a book full of great Examples of Chinese Ornament. There are so many wonderful examples of Chinese patterns, flowers and designs that I’ve been adding them (somewhat slowly, I’m afraid) to the category Asian Designs. The image I’ve shared here is from a Cloisonné piece that had more flowers, vines and leaves in the center (cloisonne drawing). 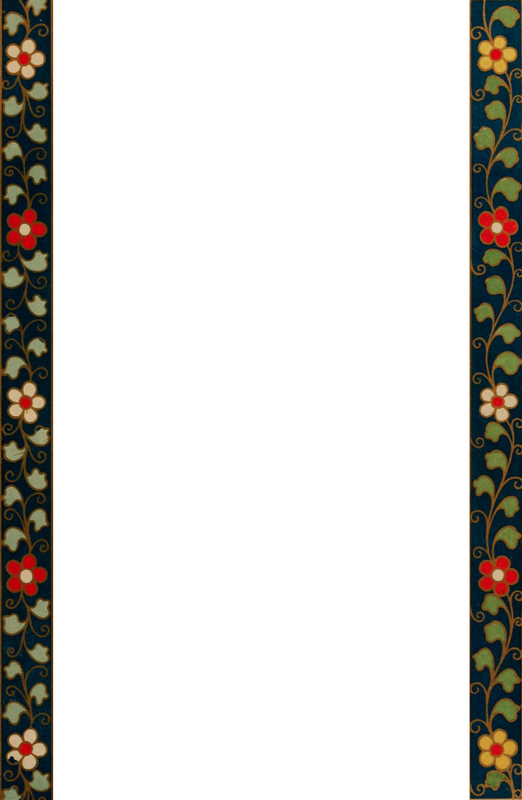 However, I thought these two stripes of flowers would make a lovely frame or border. I’ve left them in the same relative positions that I found them. However, you could easily make the center area bigger or smaller. Or, you could just use one of the floral strips. I love the bright, primary colors. The reproduction is nice and crisp and the scan I found is nice and clear too. The deep blue background really sets off the yellow, white and red flowers. Golden vines hold green flowers that are differently colored on each side of this Chinese frame. The colors also remind me a bit of Germany and the Alps. I’m thinking the embroidered trim used on some girl’s national costumes – think Octoberfest. It’s a fairly large image, so the Chinese frame shown here is a smaller version. Just click on the image itself to gain access to the full-sized image.